NTA CMAT Answer Key, Raise Ojbections 2019 & Question Papers and Respnonses at ntacmat.nic.in: The National Testing Agency (NTA) has released the Common Management Admission Test (CMAT) 2019 question paper and answer key on 01-02-2019. The examination was held on January 28 in two shifts. The Examination was held in 84 Cities in 25 States/UTs for which 64,582 candidates were registered. 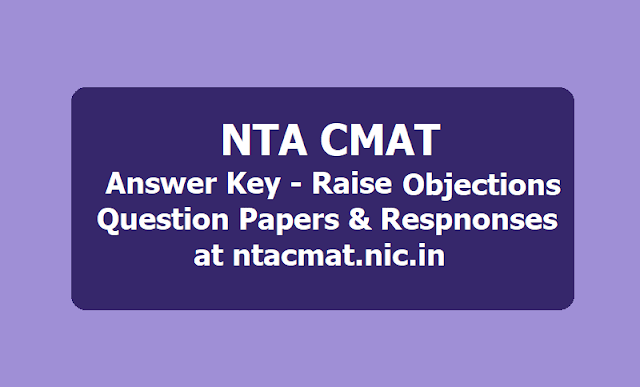 Candidates who had appeared for the examination, can check the CMAT answer from the official website ntacmat.nic.in. How to Check the CMAT 2019 Question paper and Answer key and Responses? Step 1: Visit the official website ntacmat.nic.in. This facility will remain available up to 11am on February 3. Candidates are advised to save their question papers and responses for future reference and for challenging answer keys.